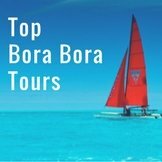 Looking for Bora Bora cheap eats? 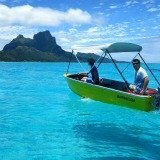 Or wondering where to lunch in Bora Bora, with a view, and on a budget? 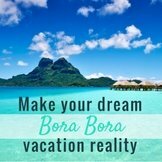 Here are descriptions of the Bora Bora cafes and simple restaurants where you can find reasonable prices for breakfast, lunch or dinner. Aloe Cafe (formerly the L'Appetisserie) is in the Pahia Center at Vaitape Village, across the road from the landmark church, Eglise Evangelique Temple. It's a pastry shop and snack restaurant with delicious pastries (try the chocolate croissants or strawberry tart) and tasty food, at reasonable prices. The menu has a wide selection of food, for a meal or snack. Everything from traditional poisson cru to crepes, paninis, salads, kabobs, pizza and hamburgers. The ice cream Sundays are also tempting. Some of the locals eat here daily. 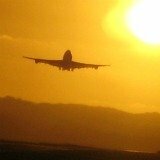 Drinks available include coffee and espresso, teas, a local selection of fresh fruit juices, and beer. 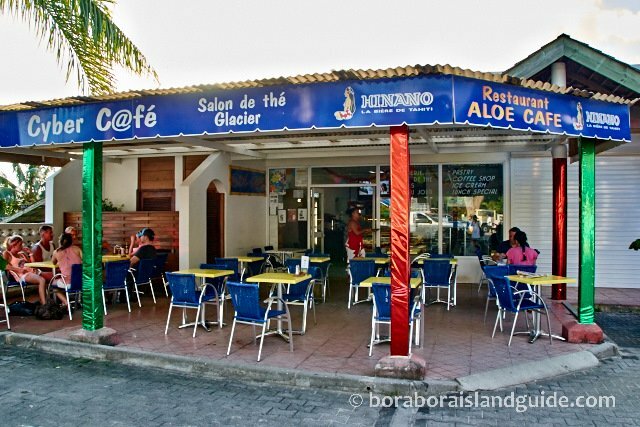 Aloe is also a convenient Bora Bora internet cafe. 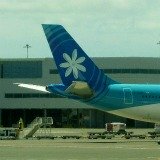 It offers internet access from 4 computers, plus printers, scanners, and webcams. Prices (subject to change) are: 400 XPF/$4.30 for 10 minutes, 1,000 XPF/$11 for 30 minutes, 1600 XPF/$17 for 60 minutes. 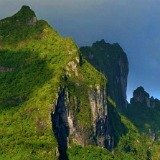 Le Paradisio (previously the Garden Cafe) is in Centre Mautera, a little shopping center on the mountain side of the road, a few minutes walk south of Vaitape Village. 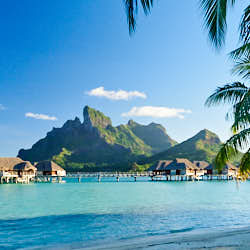 It's little known to tourists and truly a place to be amongst the locals. The menu is written in French and offers French and Turkish 'fast food' along with milkshakes, coffee and beer. 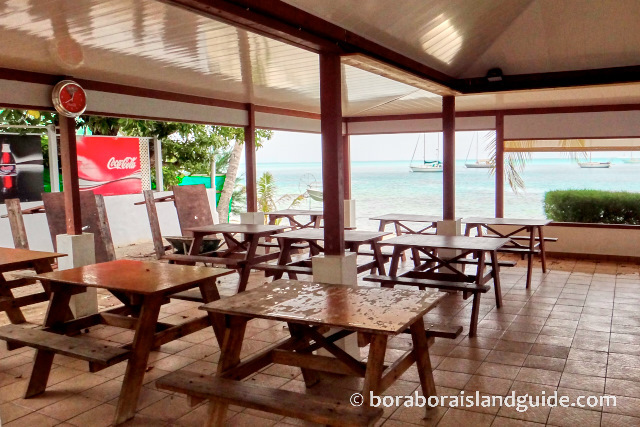 Snack Matira (also known as Chez Claude) is an open air snack bar beside the lagoon at famous Matira Beach, which is one of Bora Bora's top attractions. 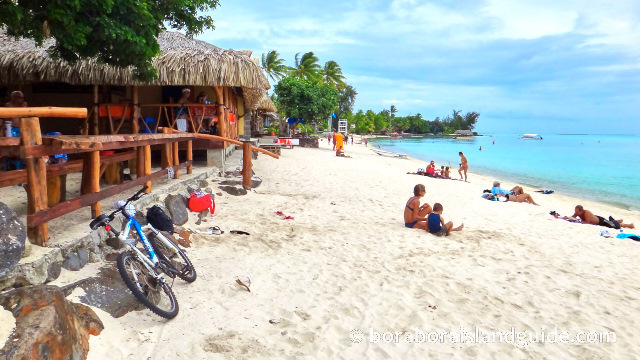 If you want to have lunch, or a snack, while visiting this stunning beach you can continue to enjoy the stunning lagoon ambiance while eating here. 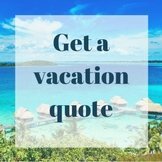 The roulette style menu offers grilled steaks and fish, burgers, pizzas, salads, omelets, and casse-croûte sandwiches, plus ice cream and milkshakes. 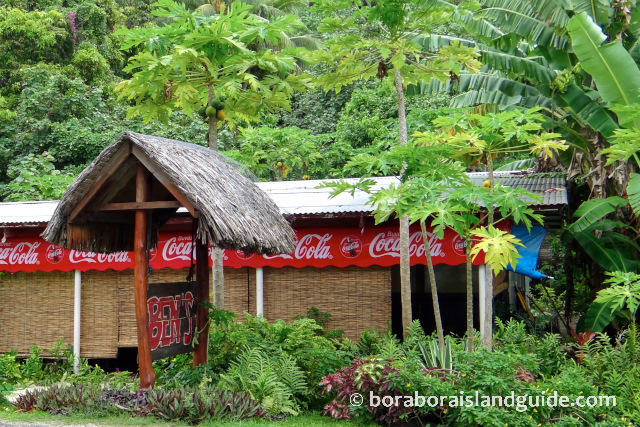 Ben's is at Matira Beach, on the mountain side of the road, across from Snack Matira. 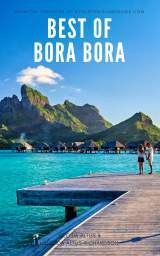 Ben Teraitepo, a native of Bora Bora, and his U.S. wife Robin, cook and serve meals with a friendly chat. 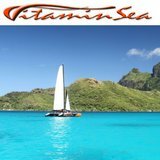 Their American orientated menu includes Tex Mex food, cheeseburgers, hot dogs, submarine sandwiches, pizzas, lasagna, spagetti with a choice of sauces, and the mandatory fresh island fish. Dishes are priced from 700/$7.50 to 1600 XPF/$17. Ben's is open 8am to 5pm daily. Closed Christmas period through 1st week in January. Cash only. 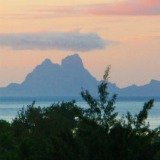 Roulette Matira is across the road from the entrance to Matira Point and Le Moana Resort. 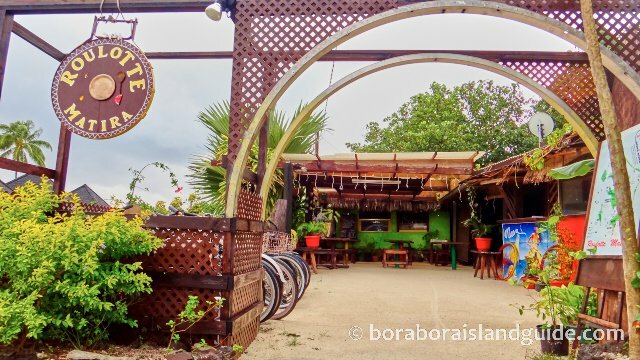 If you want to eat island style, this snack bar is a place to go for good food at reasonable prices. 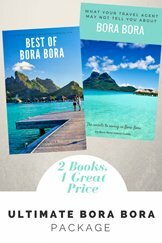 Choices include fresh seafood, a beef dish with rice, a tasty burger, or a quick sandwich. It's not a mobile roulette and it's hidden from the road. Look for the original cart which sits at the entrance. Roulette Matira's quirky outside eating environment is fun, the food is delicious, and the friendly service is offered with enough English to get what you want. You can eat here for between $10 and $18. It also has bicycle rental. 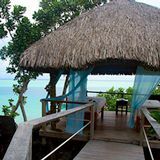 This simple, Polynesian restaurant, with a thatched roof held up by tree limbs, sits above the main area of Matira beach, near Matira Point. You don't have to leave the beach, or it's incredible views, to eat. It offers local style food, starting with a continental breakfast. Lunch becomes hamburgers, omelets or sandwiches. A roulette-like dinner menu includes steak or fish served with fries, hamburgers, chow mein and poisson cru. Dishes cost 650 XPF/$7 to 2400 XPF/$25. 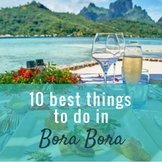 Want More ideas for Bora Bora cheap eats? 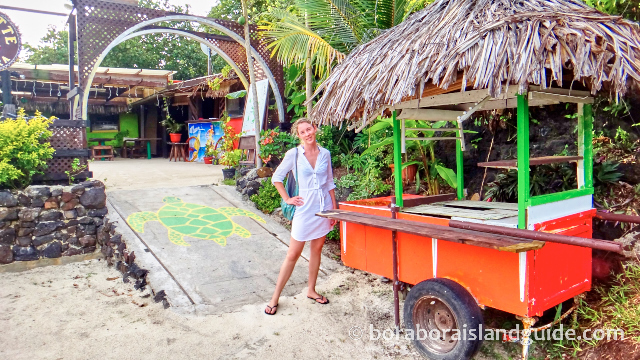 Eat like the locals! 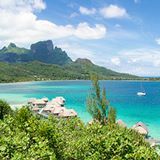 You can find quality food and enjoy really cheap eating in Bora Bora if you shop at supermarkets and dine at road-side eateries. 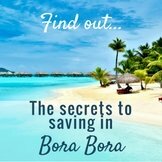 Tips on How to Save Money on Bora Bora Vacations. 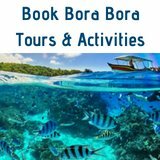 We also have a wealth of experienced traveler's tips on how to visit Bora Bora on a budget or enjoy cheap Bora Bora vacations.